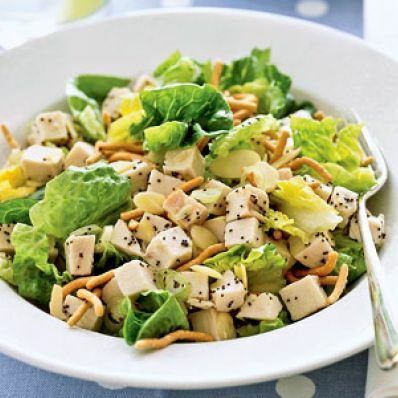 To keep the crunch in the chow mein noodles and almonds, toss this main-dish salad together and serve immediately. That's not a problem with its quick 15-minute prep time. 1 of 2 In a small bowl, whisk olive oil, vinegar, sugar, poppy seeds and pepper; set aside. 2 of 2 Clean lettuce and chop; you should have about 8 cups. Transfer to a medium-size bowl and add turkey, scallions, almonds and noodles. Toss with dressing and serve immediately. Per Serving: 4 g sat. fat, 506 kcal cal., 5 g fiber, 692 mg sodium, 34 g Fat, total, 30 mg chol., 24 g pro., 28 g carb.